This is what I wore last weekend to meet some friends at my new apartment, a basic outfit with that little something! The gorgeous jacket I guess... It wasn't too cold in Dublin last week but temperatures have dropped quite a lot now, so I'll be wearing layers over layers in the next couple weeks. Por si aún no conocíais Dscuento.com, os comento que es un portal online en el que os enteraréis de todas las ofertas de distintas marcas, como las de Zalando (pinchando aquí) y también podréis conseguir cupones descuento súper interesantes (click aquí). Disfrutad de la semana! I really like your blazer and jeans. So nice. Have a great day. WOW, these jeans look amazing on you, they're super cool! hola Guapa, me encantan tus outfits! te sigo! te dejo el mio por si te apetece seguirme!! besos! Great outfit! I love your scarf & jacket. Una preciosidad de chaqueta, me encanta todo el look!! Me encanta tu estilo! Este look es total! 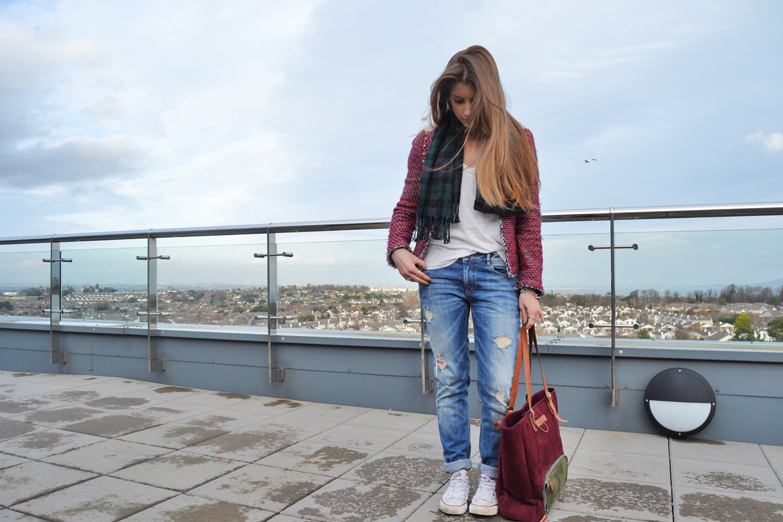 Love the jacket and jeans! That bag is so sooo nice !! *. * and I like yoru blazer too !